王盈盈, 刘青, 唐丽琴, 魏伟. 小檗碱对高糖诱导足细胞功能及相关蛋白表达的影响[J]. 中国药理学通报, 2018, 34(8): 1158-1162. WANG Ying-ying, LIU Qing, TANG Li-qin, WEI Wei. Effect of berberine on high glucose induced podocyte functions and related protein expression[J]. Chinese Pharmacological Bulletin, 2018, 34(8): 1158-1162. Abstract: Aim To investigate the protective effect of berberine on high glucose(HG) induced podocytes injury and the detailed mechanism. 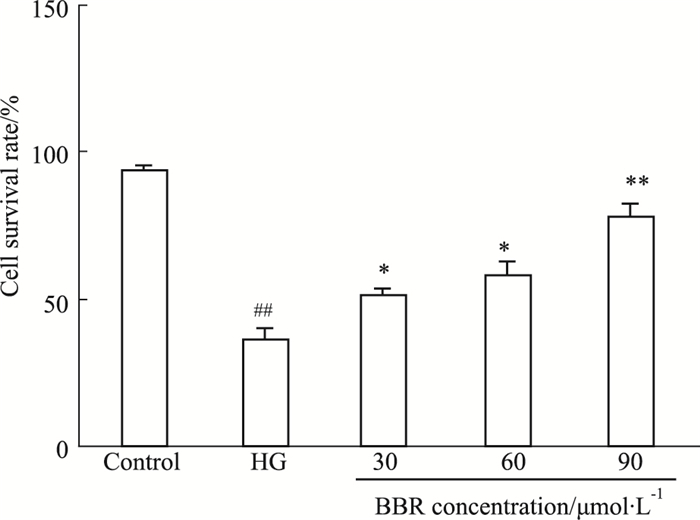 Methods Mouse glomerular podocytes were cultured in vitro and divided into control group, HG model group, and different concentrations of berberine (30, 60, 90 μmol·L-1) treated group respectively. The cell proliferation was detected by MTT assay; the apoptosis was detected by Annexin V-FITC/PI double staining; the ability of migration was observed by transwell assay; the expressions of nephrin, podocin and desmin were detected by Western blot; the adhesion function was detected by adhesion ability assay. Results The HG-induced podocyte viability was significantly promoted by berberine (30, 60, 90 μmol·L-1). The apoptosis and migration of HG-induced podocyte significantly decreased after exposure to berberine. 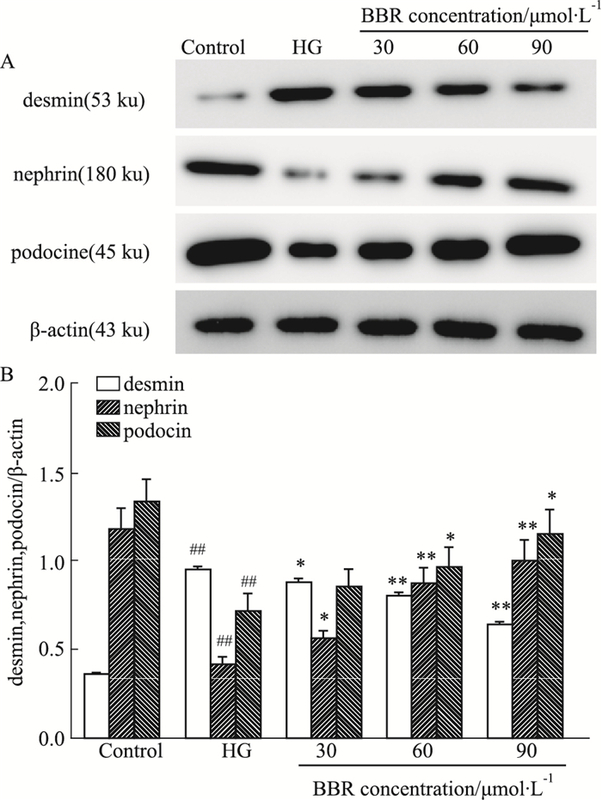 After treatment with berberine(30, 60, 90 μmol·L-1) in HG-induced podocyte, the expression of nephrin and podocin markedly increased, while desmin expression significantly decreased. Meanwhile, the adhesion ability increased after treated with berberine. Conclusion Berberine improves the damage of podocyte induced by HG, which may be related to the protection of nephrin and podocin in podocytes. 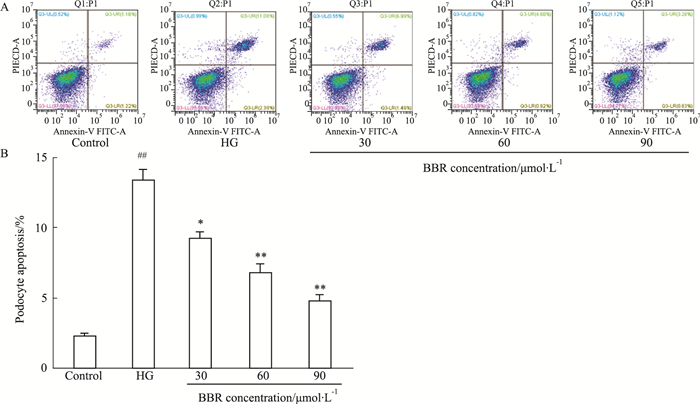 Fig 2 Effect of BBR on apoptosis of HG-induced podocytes (x±s, n=3) A: Annexin V-FITC/PI double staining assay detected the effect of BBR on apoptosis of podocytes; B: Quantitative analysis showed the percentage of the apoptotic podocytes relative to different groups using CytExpert software. ##P < 0.01 vs control group; *P < 0.05, **P < 0.01 vs HG group. 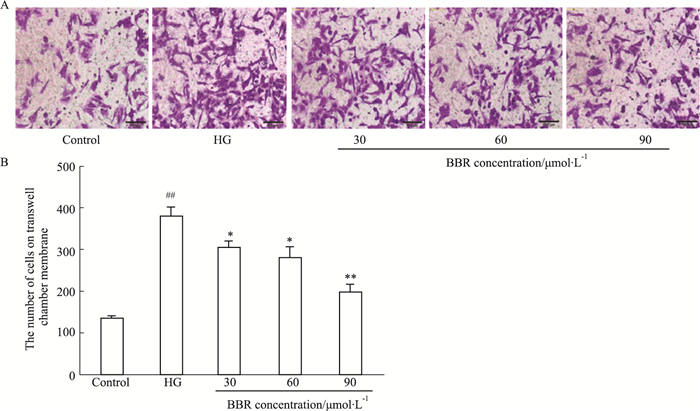 Fig 3 Effect of BBR on migration ability of HG-induced podocytes (x±s, n=3) A: Cell transwell assay detected the effect of BBR on cell migration ability of podocytes, scale bar=100 μm; B: Quantitative analysis showed the number of cells on transwell chamber membrane. ##P < 0.01 vs control group; *P < 0.05, **P < 0.01 vs HG group. Mizuno T, Hayashi T, Kato R, et al. Risk factors for an early dialysis start in patients with diabetic nephropathy end-stage renal disease[J]. Ther Clin Risk Manag, 2014, 10: 73-6. 李芮, 王会玲, 刘楠梅, 等. 小檗碱在高糖及糖基化终末产物诱导足细胞损伤中的保护作用[J]. 中华肾病研究电子杂志, 2016, 5(4): 168-71. Li R, Wang H L, Liu N M, et al. Protective effect of berberine on podocyte injury induced by high glucose and advanced glycation end products[J]. Chin J Nephrol, 2016, 5(4): 168-71. 王竹, 刘俊田, 孙万森, 等. 祛风通络方对阿霉素肾病大鼠足细胞Desmin及CD2AP蛋白的影响[J]. 中国中西医结合杂志, 2014, 34(2): 203-8. Wang Z, Liu J T, Sun W S, et al. Effect of Qufeng Tongluo Recipe on expression of desmin and CD2AP proteins in adriamycin-induced nephropathy rats: an experiment alresearch[J]. Chin J Integr Trad West Med, 2014, 34(2): 203-8. 倪伟建, 丁海华, 唐丽琴, 等. 小檗碱对糖尿病肾病大鼠肾组织VEGF表达的影响[J]. 中国药理学通报, 2015, 31(6): 795-800. Ni W J, Ding H H, Tang L Q, et al. 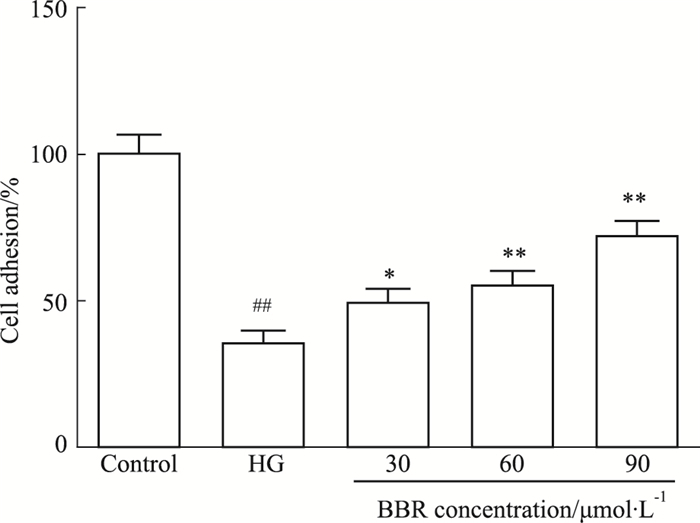 Effect of berberine on the expression of VEGF in renal tissue of diabetic nephropathy rats[J]. Chin Pharmacol Bull, 2015, 31(6): 795-800. Chinese Pharmacological Bulletin, 2018, 34(8): 1158-1162.